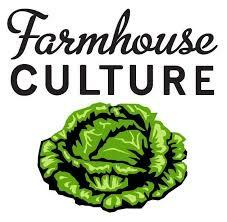 Farmhouse Culture, a leader in live active cultured foods and beverages, was founded in 2008 by Kathryn Lukas in Santa Cruz, CA. A food alchemist and classically trained chef, Kathryn first fell in love with sauerkraut (“kraut”) while cooking in the restaurant she owned in Stuttgart, Germany. When she returned to her native California, Kathryn saw the opportunity to introduce Americans to the taste of fresh organic kraut and began reviving ancient fermentation traditions with reimagined globally inspired flavors. Today, Farmhouse Culture is recognized as being on the forefront of fermented and probiotic rich foods and beverages. All Farmhouse Culture Kraut and Gut Shot products are Organic, Non-GMO, Plant Based and Gluten-Free. Just like that crunchy spear, but ready to help balance your microbiome too! This kraut is a zesty combination of fresh garlic and dill with that oh so comforting taste of homemade pickles. A perfect melding of Korean wisdom and Californian ingredients, our Kimchi is full bodied, bursting with flavor and packed with beneficial probiotic cultures.� Napa cabbage is enveloped with zippy ingredients like wakame, cayenne, and bird�s eye chili. Oh, and did we mention, seriously addictive! THE TASTE EXPERIENCE: A zesty combination of fresh garlic and dill with that oh so comforting taste of homemade pickles. THE TASTE EXPERIENCE: Combines the earthiness of beets with the fresh crisp zing of ginger and no added sugar or preservatives. Sure to warm the heart and revitalize the body. Just like our immensely popular kraut and gut shots, these Dill Pickle Kraut Krisps offer the perfect balance of vinegar, dill, and garlic. They are the perfect addition to your lunch, but equally as satisfying right out of the bag. With that crunch and familiar tang, you might just think you grabbed an actual pickle spear out of the jar!